A short stop during my Thailand Odyssey is Galanan Wa Wanwaan. What urged me to go here was their signage made of watercolor featuring their various coffees and teas. After the heavy hearty meal, coffee seemed to be the perfect next step, thus I went. The place actually serves more than coffee, it’s actually a Thai restaurant in itself. However, I didn’t get the chance to order any of their food items as I was still quite full from my previous venture. I ordered their Hot Thai Coffee (50 Baht). 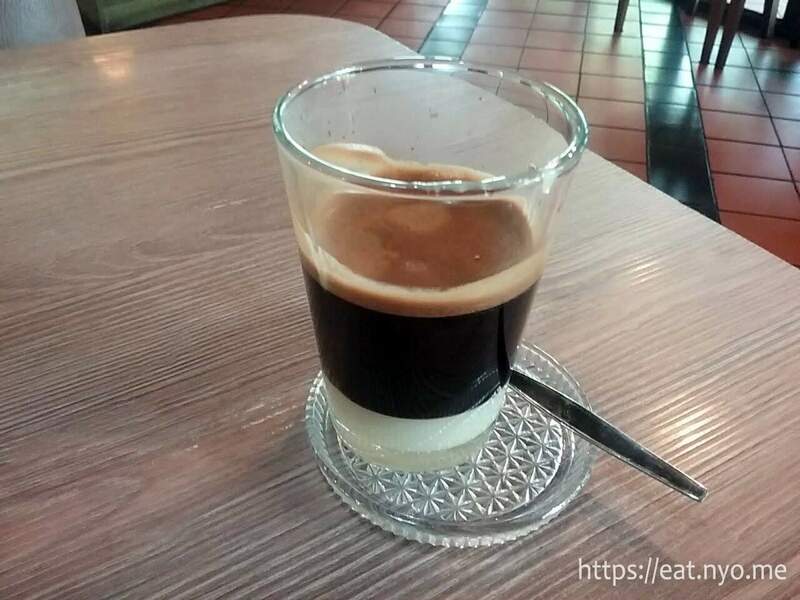 I was given a small glass mug, or perhaps a large shot glass, half-filled with Hot Thai Coffee with a layer of thick milk at the bottom. I estimate this to be around 10 to 12 ounces. I tried the coffee on its own first without mixing the milk. It had a fruity, chocolatey flavor which was not at all acidic or metallic, similar to some coffees we’ve tried in Singapore. Not really my favorite as it lacks any roasty-bitter flavor, it was still quite good, perhaps even non-coffee but chocolate lovers might enjoy. Mixing in the milk essentially turned it into a mildly sweetened latte. While I’d rather forgo that and have it black, it wasn’t offensively sweet and was actually quite pleasant. After taxes, I paid 55 Baht. Converting it yields almost 90 Php. I guess it’s priced similarly to third-wave coffee places, although this one might be lacking in amount. Still, Galanan Na Wanwaan did give me some time to relax and enjoy the hot caffeinated beverage I ordered. In hindsight, I should’ve gotten the cold version which was similarly priced, as the weather in Thailand was quite hot and stuffy. Oh well, at least the place was airconditioned. Since this article is a bit short, I’d take this opportunity to detail some of my observations in Megabangna. It’s not actually all expensive; the places I went to definitely were on the higher end, but it had a food court near its supermarket that serves cheap(er) Thai food, and even street food among them. I noticed that the prices here don’t exceed 100 Baht. While still a bit more expensive than the cafeteria in AIT, they’re still a much more budget-friendly option than the places I went to (including the next one). The only reason I opted not to go to these place was that I was carrying my luggage back home and it proved to be difficult to find a seat in the communal chairs—some are also standing tables only. It was also much more chaotic. I guess part of the price I paid for in Galanan Wa Wanwaan was being able to relax while I enjoyed their coffee. In the center of the open area, there was a marketplace where local merchants sold local clothing, souvenirs, dried produce, and even local street food in open stalls. It’s basically similar to what most Philippine malls have nowadays, except this one is in the open area under the sun without covered air conditioning. I guess it’s mostly similar to the one in UP Town Center. While there were some tables and seating which were ventilated with fans, it was still much more comfortable to stay inside the restaurants, especially with the current hot Thailand weather. Finally, the mall also had a lot of buffet places, namely Korean barbecue or Japanese yakiniku and sushi places. These places had their queueing stations and by lunch time all throughout the afternoon, these queues were packed. They were priced similarly to our local offerings at 300-1000 Baht, depending on the kinds of meat and sushi you’ll get. I didn’t try these places though, since I wanted to try local Thai food. Anyway, this further confirmed my assertion that Thailand is quite similar to the Philippines in terms of food, especially non-local food. In fact, my next blog adds more to this argument, so stay tuned…. Recommended for: Chocolatey coffee lovers. Not recommended for: Coffee haters. Smart nomnomnom tip: Try it without mixing first, then mix; always aerate.